Motivational Interviewing and Motivational Enhancement refer to a series of techniques designed to facilitate a person’s natural wish to make positive changes. The approach was, in part, developed by clinical psychologists Professor William R Miller, Ph.D. and Professor Stephen Rollnick, Ph.D.
MI is a goal-oriented, client-centered counseling style for eliciting behavior change by helping clients to explore and resolve ambivalence. It is related to and draws some of its insights from the Transtheoretical Model of change (Prochaska & DiClemente, 1983; Prochaska, DiClemente, & Norcross, 1992). We have summarized that system for thinking about the process of change in articles on this website that may also be useful to review. As with the Client-Centered Therapy of Carl Rogers, Motivational Interviewing is based on the fundamental belief that people have a natural inclination towards positive change. 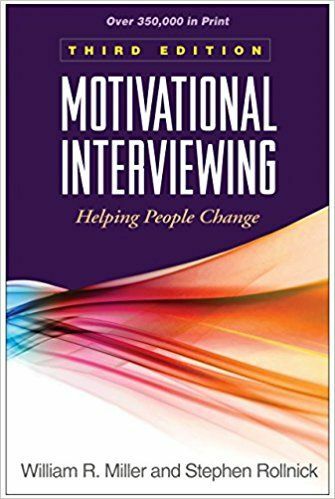 Unlike Carl Rogers approach to therapy, motivational interviewing focuses attention on certain aspects of the process of change in order to facilitate change. MI involves attention to the natural language of change in order to have more effective conversations with people considering change however one essential principle underlying MI is that these conversations have to be fundamentally rooted in the values, beliefs, and interests of the patient. Because significant change almost always creates ambivalence, simultaneously wanting or not wanting change to take place, conversations with people considering change include two types of statements. One type is called “change talk” – statements that consider and support change, that examine its benefits. The opposite type is “sustain talk” – arguments and statements that support not changing. People often will talk about change in ways that rapidly alternate between the two types of talk. And frequently as change begins to seem more real, the negative aspects will come into closer focus, but probably not in a realistic way. MI assumes that most people who are told what to do and why they should or must do it will tend to resist that suggestion. A starting place for change conversations is often to explore the reasons not to make a change but to do so in a way that is realistic. Then the conversation may shift to exploring reasons for making a change. How might you go about making a change in order to be successful? What are the three best reasons for doing it? How important is it for you to make this change and why? It’s hard to really capture the process but we really like this video from the Motivational Interviewing Network of Trainers (MINT). Two blog posts from our sister site, moodsurfing.com, are filled with good information.